I’m sure so many of us feel this way, and it saddens me. Not only regarding how we look, but similar thoughts like “once I get that promotion, I’ll be successful”, “once I graduate college, I’ll be smarter”, “once I learn more, I’ll be able to help people”. I’m here to say indefatigably, this is not true! If we’re forever looking toward the future for our happiness, never living in the present moment, we will forever be putting off our lives. I understand that our society, our culture, has placed this value on always bettering ourselves, and that in itself isn’t a bad thing, but it is a bad thing when it leaches away your happiness now. Yes, I’d like to lose some weight, I’d like to be in better shape. I have goals, but that doesn’t keep me from being happy with who I am in this skin. Be authentic, be the real you, and happiness will come. Easier said than done, I know, but so very worth it. Why is it that our culture praises youth and parenthood but ignores the very people who have made it past these stages intact, filled with wisdom, who have the most to share? I’d like to posit something and see how it lands for you: Our society would be drastically altered if the people within it were to be comfortable in their own skin. Think about it. How many companies would go out of business if there were no need for face lifts, diet pills, crazy exercise equipment, eye creams, cellulite reducers, etc., etc.? It seems that every industrialized country is in a similar position. Did you know that in those countries that have predominantly darker-skinned people, skin-lightening products are one of their top selling items? While here we have tanning salons and tanning lotions to make lighter skin darker and “more appealing”. It seems no matter what you look like, it’s never good enough. There is a war going on between every kind of dual-sided look; models are too skinny or too tall, athletes have too much muscle, mothers have too many stretch marks, older people have too many wrinkles. It never ends. Unless we shift our way of thinking. Now, I know that all of a sudden having confidence in how you look is a very tall order. So, as a simple first step, try becoming aware of the things that are advertised to you. Is it truly going to make you a better person, or is it just some company trying to make a quick buck off your lack of self esteem? Step two: think about your 10-year old self, or someone you love who is younger. Picture her/him sitting across from you on the couch. Think of all of the negative self-thoughts you say to yourself every day. Would you say those things to them? I highly doubt it. My guess is you’d tell them how loved and special they are. How the world is in need of their gifts, the gifts that they can’t see for themselves right now because they’re buried in self doubt. Give your younger self a big hug and send her/ him all the love you so desire right now. This may seem silly, but I promise you, it is a powerful exercise in self love. Step three: make a list of your perfect future life. Chances are, a lot of things on this list can be done right now! Think you can’t find your future spouse until you’re a certain weight? Would you really want to marry someone who couldn’t love you with a few “extra pounds”? Think you can’t do a certain exercise class until you’ve lost weight? While it might be more difficult, go do that class and appreciate how strong your body is at this moment. Think you can’t go on vacation to the beach until you look good in a bikini? I’m here to tell you that every body is a beach body. 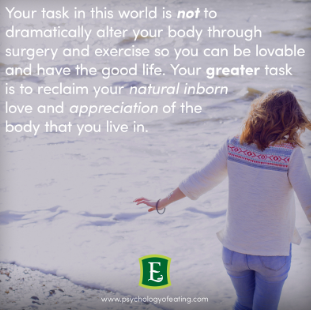 We place so much emphasis on how we look when there is so much more to who we are as people. We are body, mind and soul. All three create the unique, loveable individual that is you. So the next time you see a blip on the cover of a magazine promising “10 Foolproof Ways to Lose That Weight”, or see an ad that promises to get rid of wrinkles/cellulite/insert whatever you want here, please take a second and consider if this product will change who you are at a fundamental level. If not, I’d wager a guess that you don’t need it, the company needs you to need it. Tap into your happiness right now, this very moment. You are all you need. You exist, you are a human on this beautiful, crazy world. Therefore, you deserve love. That’s it. Nothing more to it.